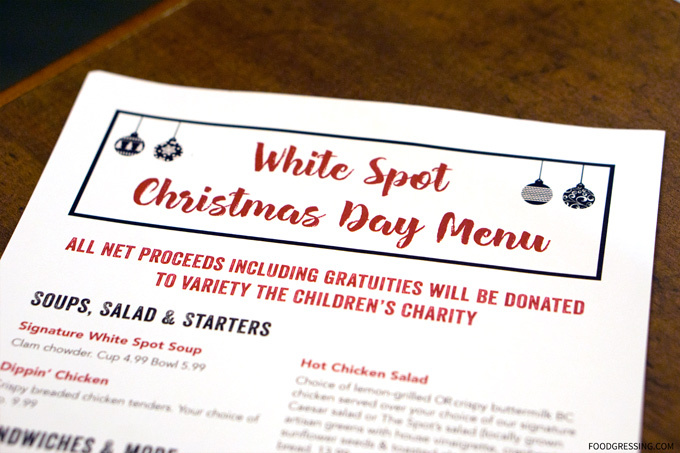 This past Christmas, White Spot locations at Kingsway in Vancouver and Richmond Centre opened for lunch on Christmas Day to raise much needed funds for two local charities. 2017 marked the 16th consecutive year for this yuletide tradition. This year’s fundraiser generated $12,488 at Richmond Centre and $8,894 at Kingsway Vancouver for the Richmond Hospital Foundation and Variety – The Children’s Charity, respectively. Since its inception, more than $222,000 has been raised by the luncheon, in which all proceeds, staff time and tips from the afternoon are donated for a good cause. My family and I attended the Christmas Luncheon at the Kingsway location to support the cause. We put our name down on the wait list at 11:20 am and our wait was an hour. TIP: The wait was minimal after 1 pm so it might be better to come in at the time next year! There was also a takeout window available if you didn’t want to wait. The restaurants were open from 11 am – 3 pm and a special set menu was offered including Legendary burgers and other Spot Classics. My family enjoyed the Double Double, Chicken & Mushroom Fettuccine Alfredo, and Dippin’ Chicken. My husband had the Double Double which was a ½ lb beef burger made with double beef patties, double cheese, lettuce, tomato, Triple “O” sauce & double dills. He found the burger tasty but a bit too thick to eat! A Legendary would have been a more practical choice for him. 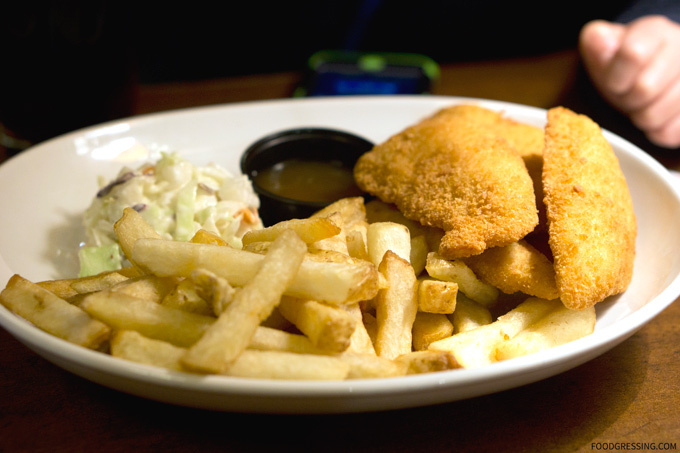 This is my go-to dish at White Spot. 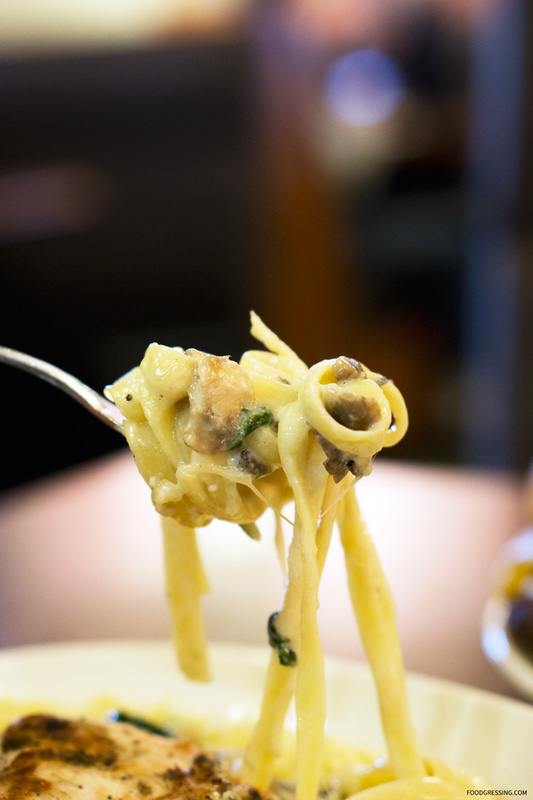 It had a lemon-grilled chicken breast over fettuccine noodles tossed in a classic Parmesan cream sauce with sautéed mushrooms and spinach. On the side was garlic panini bread. The chicken was a sizeable piece and was very tender. The sauce was wonderfully creamy and all the noodles were nicely coated with the sauce. I loved the earthy flavors from the mushrooms. My son *loved* the crispy breaded chicken tenders and honestly, adults would too! I tried some of it and they were crazy good. The coating was light but well-seasoned and crispy while the meat was very tender. Despite how busy it was, staff were most certainly in the Christmas spirit and were working well together to make it all happen. Kudos to the girls at the front who were managing the seating and the wait list. They were friendly and put on a great attitude while managing those who were waiting. Table service was on point as well with orders being taken, food being delivered and bill brought to us all in a timely manner. 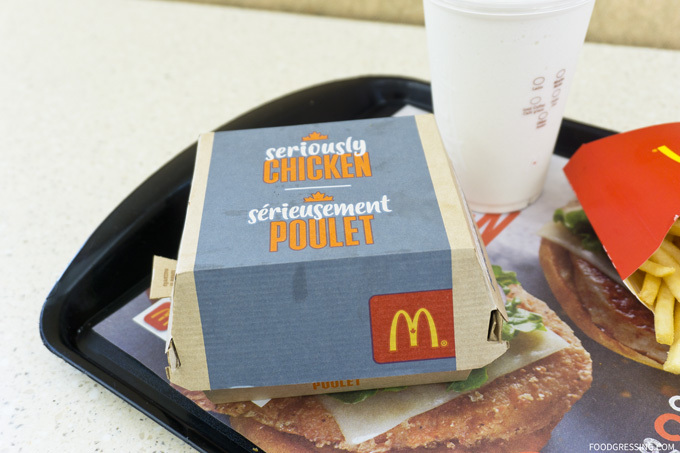 This past summer, McDonald’s Canada introduced new sandwiches to their premium chicken lineup: the Seriously Chicken Sandwiches. These sandwiches come in two varieties, Tomato & Mozzarella Chicken or Guacamole & Jalapeno Chicken, with your choice of grilled or crispy Canadian grain-fed seasoned chicken breast. 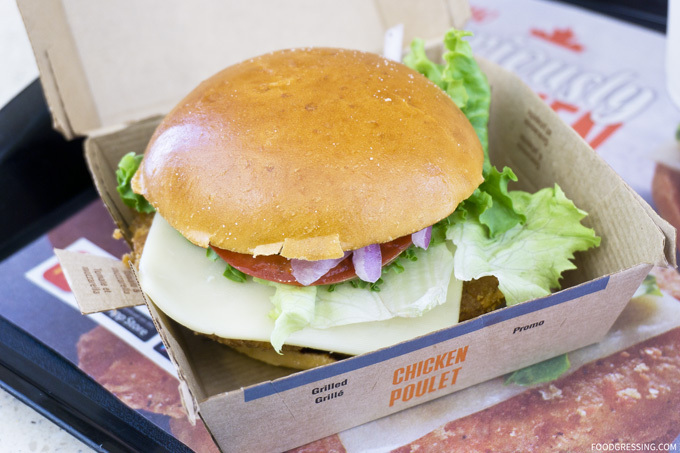 The Tomato & Mozzarella Chicken Sandwich is topped with tomato and herb sauce, mozzarella cheese, lettuce, tomato and red onions on a toasted Brioche-style bun. The Guacamole & Jalapeno Chicken Sandwich has guacamole, jalapenos, mozzarella cheese, lettuce, tomato and red onions on a toasted Brioche-style bun. 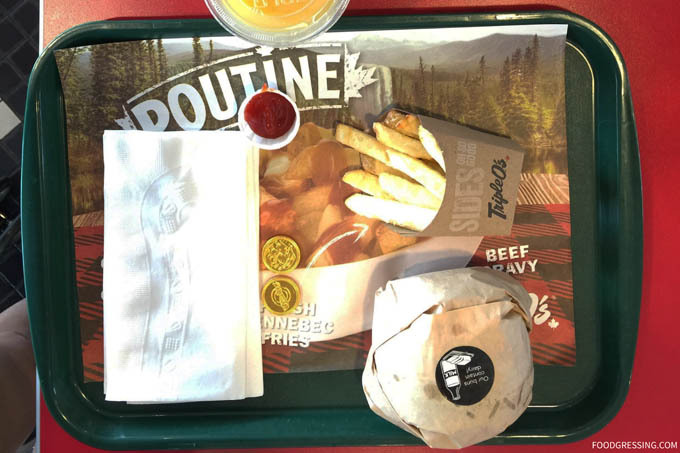 While I was in Calgary this summer, I decided to give the new Seriously Chicken sandwich a try. Note: This post is not sponsored and this review is done anonymously. I went with the Tomato & Mozzarella with Crispy Chicken. In terms of taste, it was seriously good! Definitely much more delicious than the McChicken. I really enjoyed the breading for the chicken which was wonderfully crispy. The chicken itself was very juicy and tender, which fared a lot better than the dry McChicken patties I have had many times. The lettuce and tomatoes used also seemed quite fresh and crispy. The brioche bun used was sweet, light and fluffy; a very nice touch to the sandwich. I also enjoyed the fact that McDonald’s made note that it is Canadian grain-fed seasoned chicken breast and that you have a choice of having the chicken grilled or crispy. Now in terms of nutrition, the Tomato & Mozzarella with Crispy Chicken has the highest calorie count (630 calories) of all the McDonald’s Chicken sandwiches on the menu. If you went with the grilled version which has 500 calories, you eat 130 calories less. 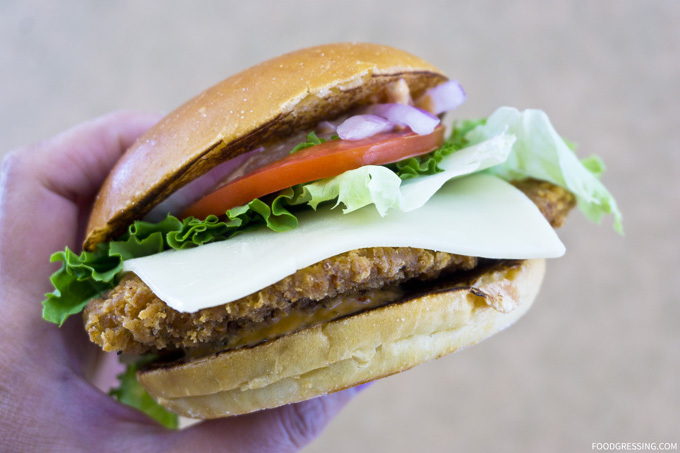 The Guacamole & Jalapeño Seriously Chicken Sandwich is also easier on the calories: 570 calories with crispy chicken or 440 calories with grilled chicken. But if you’re counting carbs, the Tomato & Mozzarella with Crispy Chicken has the pretty much the same number of carbs (57 g) as the Guacamole & Jalapeño with grilled chicken (58 g). Aside from the Snack Lab, the only real food establishment at Science World is Triple O’s. I visit Science World regularly with my family and Triple O’s is a place where we have eaten a few times. While there isn’t much to remark regarding the food, I just wanted to share a few thoughts on the location itself. One of the interesting things about this Triple O’s is that it has a beautiful view of the False Creek waterfront. Waterfront fine fast food dining at its best. I quite enjoy seeing the boats passing through the area. 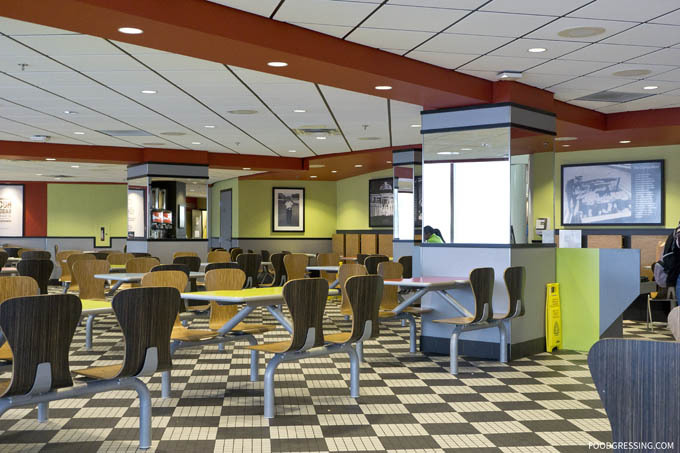 The restaurant is separated into an ordering area and a cafeteria-like seating area. It’s not a sit-down restaurant with servers waiting you. You pick up your food at the counter where you made your owner. 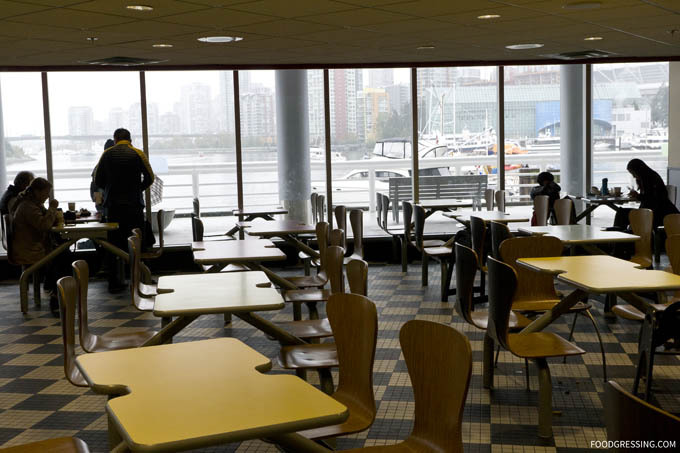 The dining area is very spacious perhaps to accommodate school groups to Science World. Only customers of Triple O’s are allowed to sit at those tables. 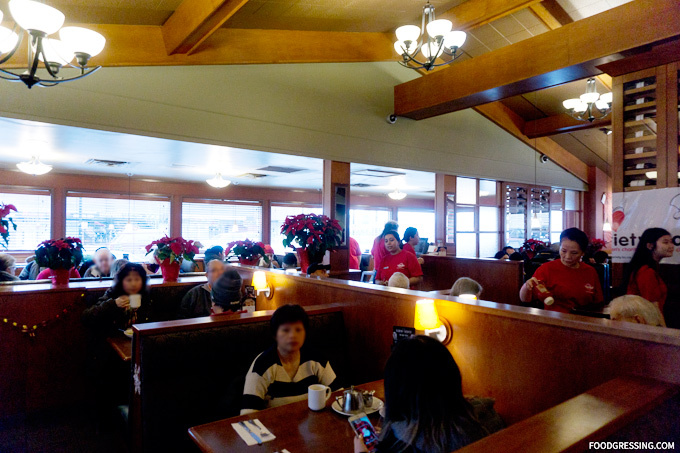 While the restaurant is very spacious, it’s practically never full. So the ambiance is rather cozy and comfortable. 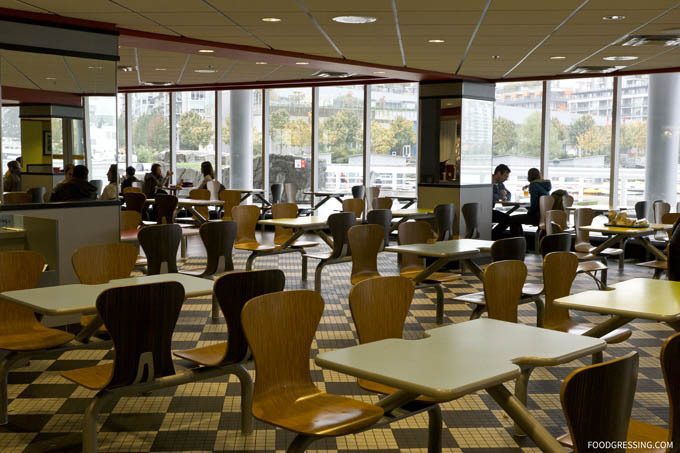 In the summer, they have a take-out window to serve milkshakes; however, those customers do not get access to the seating area. 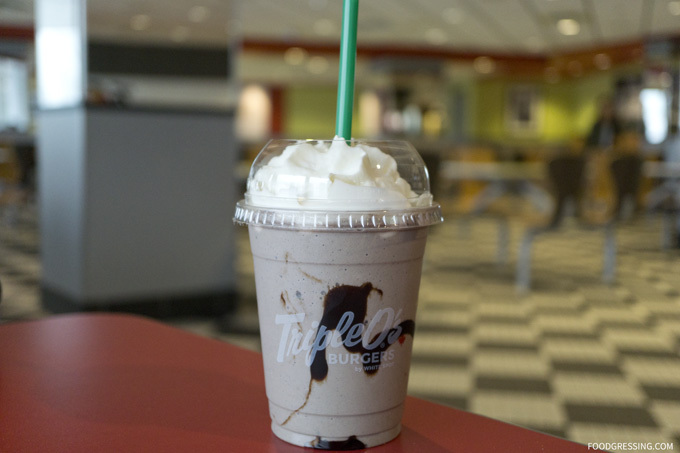 One one occasion, I tried a limited available Cookies & Cream Milkshake. Made with premium vanilla bean ice cream from Island Farms, real Oreo cookie crumble and whipped cream topping, the milkshake was pretty thick and slushy at first. After it thawed out a bit, it was easier to drink. Pretty good in terms of flavour. I would order it again in the future. I have also order a Kid’s Meal ($6.49) which comes with choice of hamburger, cheeseburger, chicken tenders, 2-piece fish, grilled cheese or hot dog. Sides included are fries or apple slices and a pop, juice or milk. We have ordered the cheeseburger, fries and orange juice a few times – pretty standard fast food quality. The burger patty wasn’t dry and the fries were crispy. Nothing to complain about but nothing to rave either. I regularly participate in the Vancouver Gastropost missions, and this week’s mission was about burgers. 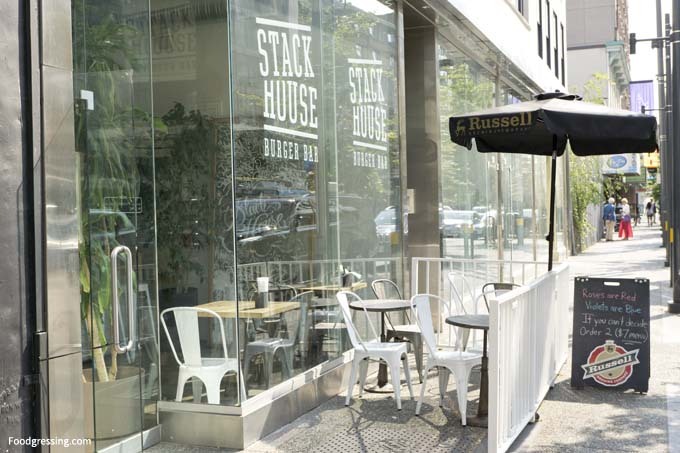 On the topic of burger joints in Vancouver, it had been a few years since I went to the Stackhouse Burger Bar. 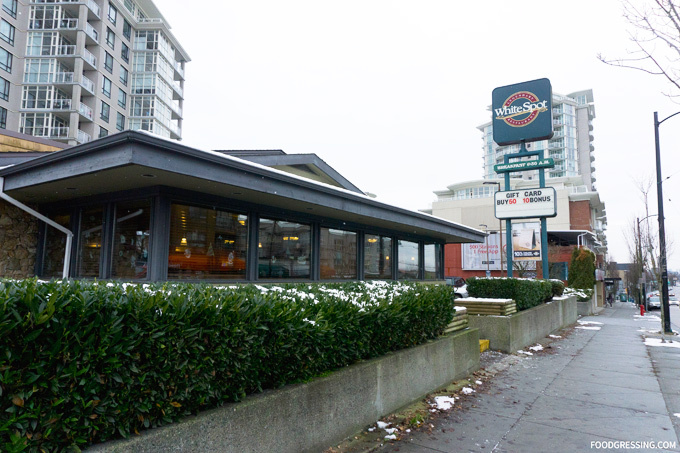 I was inspired to revisit this eatery located in the Granville Entertainment District to see if their food is just as good as I remembered it. I visited Stackhouse Burger Bar for the first time a few years ago when a friend was back in town. She wanted to go there because she had been there before and enjoyed the food. At that time, I remember my impression of Stackhouse being kind of hipster chic. Their light chrome interior had some playful design elements. 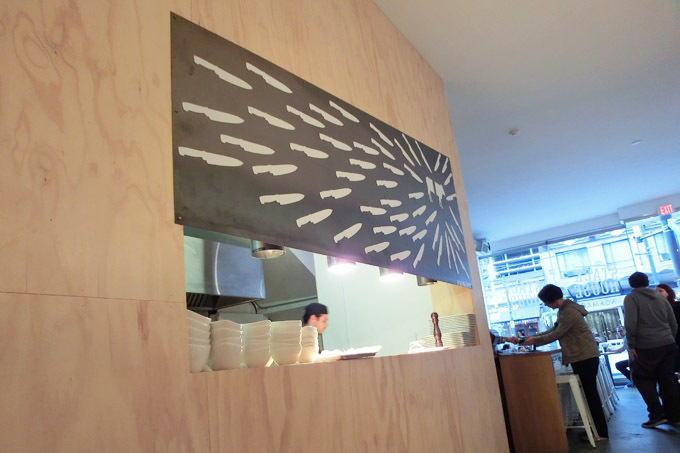 Above the kitchen window was an interesting art piece of an army of knives directed at a cow. Knife statues lined the walls while an artistic murale of a pack of wolves made an interesting choice for a decor piece. Some of the wolves looked ferocious, even hungry. Our table was provided with a flask of water. 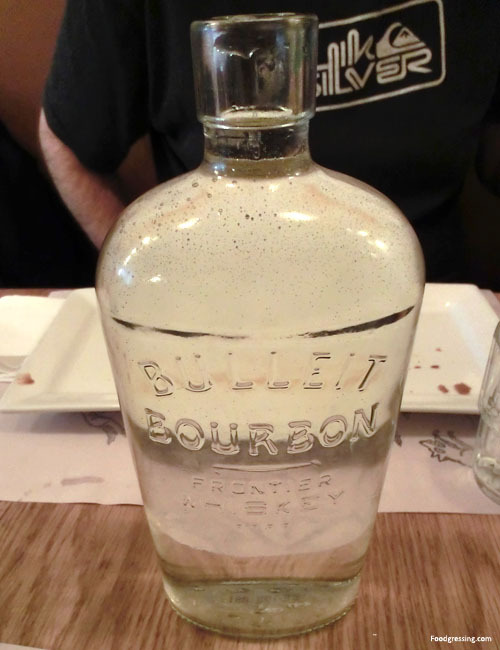 It is convenient in my opinion as I do not have to wait for the server to refill my glass. However, it reduces the provision of customer service on the restaurant’s part, which I think is integral to a dining experience. 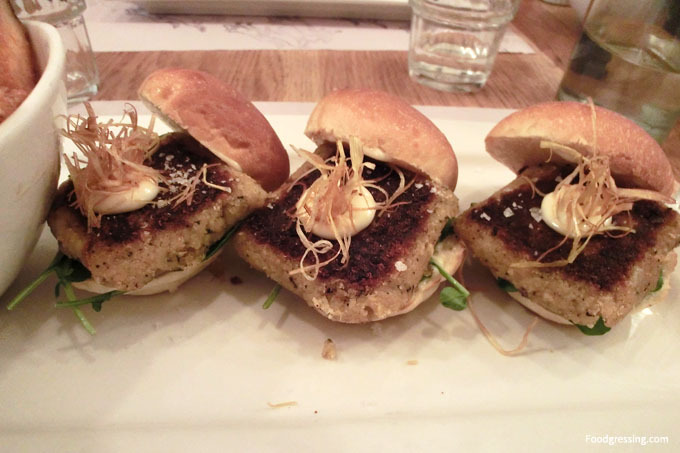 I had the dungeness crab sliders ($14) with panko bread crumbs, miso aioli and watercress. It was topped with fried leeks and served on a brioche bun. The patties were essentially crab cakes, and were moist and crispy. 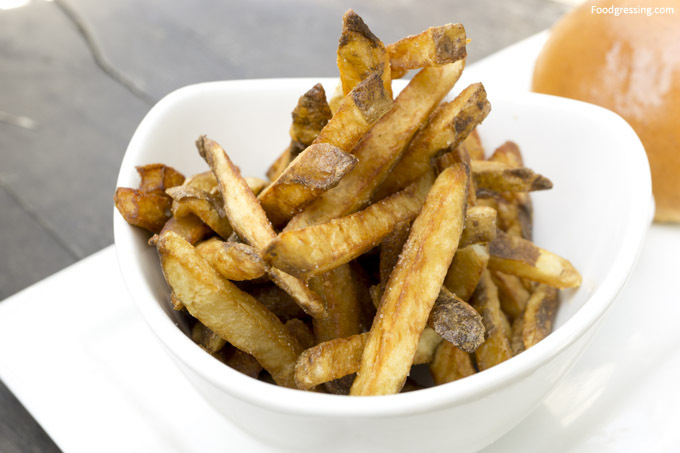 The sliders came with an excellent cut of fries that were wonderfully crispy with just the right amount of salt. 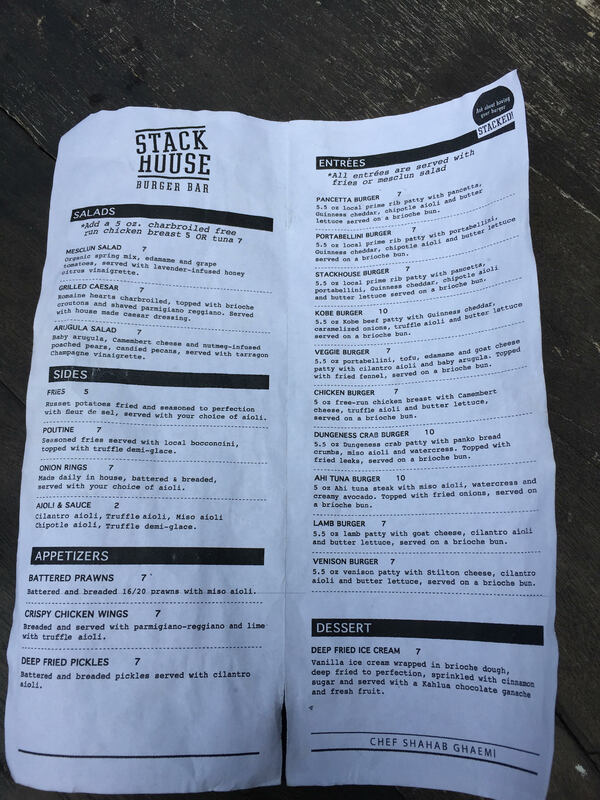 My husband enjoyed stackhouse sliders ($14). They were prime rib mini burgers with pancetta, portabellini, Guiness cheddar, chipotle aioli and butter lettuce on a brioche bun. The patties were thick, juicy, flavourful and the pancetta was delicious. For dessert, we had shared the deep fried ice cream ($9). 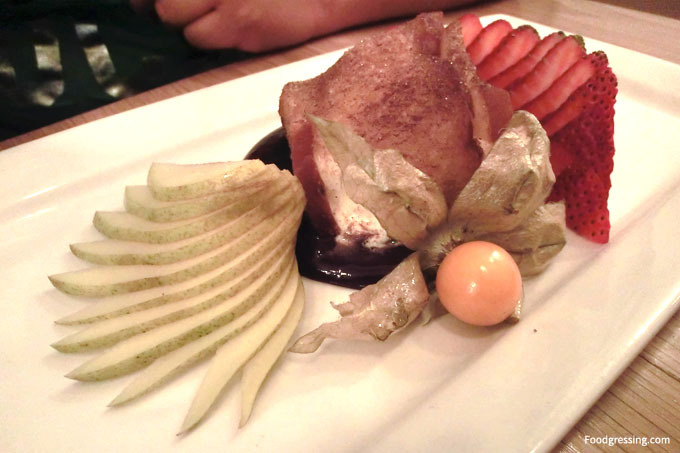 The vanilla ice cream was wrapped in brioche dough, sprinkled with cinnamon sugar and served with Kahlua chocolate ganache and fresh fruit. I enjoyed the warm, crispy shell around the ice cream that was still cold. 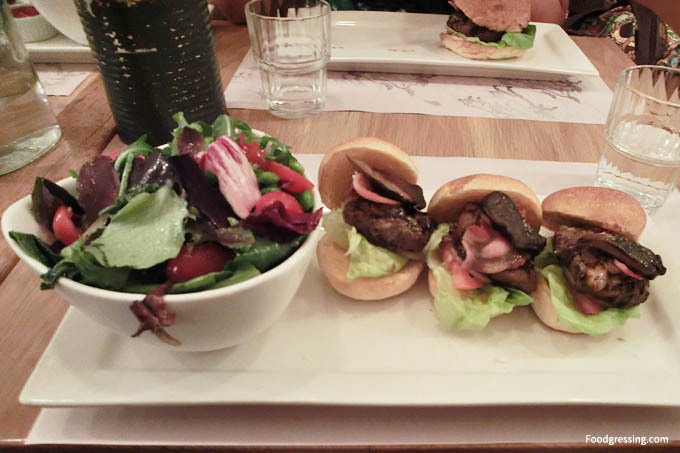 The food was pretty good at time, but on the expensive side since the sliders were $14. 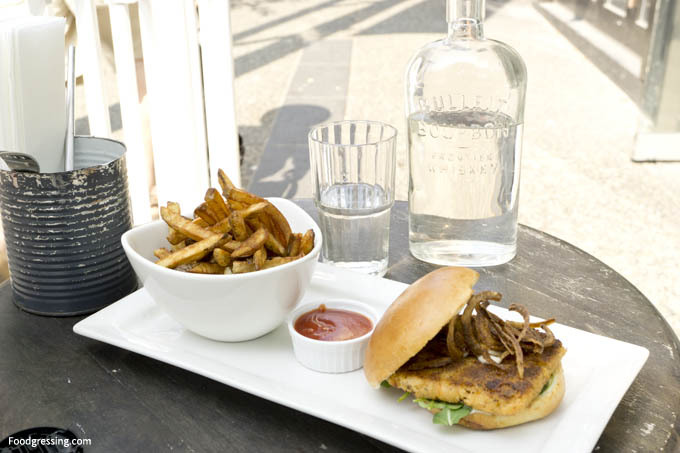 Their other burger options ranged from $14 – $21. 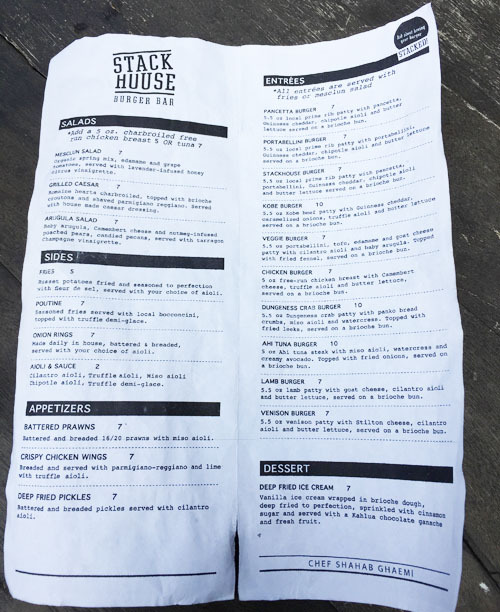 I recently saw on Stackhouse Burger Bar’s Instagram that they now have a $7 dine-in menu. $7 for a burger and fries seems like a good deal. I was curious as to how the food would be now that prices are halved from a few years ago. There are a few premium burgers that cost $10 like the kobe burger, dungeness crab burger and ahi tuna burger. Zomato still has an outdated menu posted so here is a higher-resolution photo I took of the menu. It was a sunny afternoon so I decided to enjoy my meal on their patio. Because I enjoyed the dungeness sliders last time, I decided to order the dungeness crab burger ($10). I also received a large flask of water like last my last visit. The service was friendly and attentive. 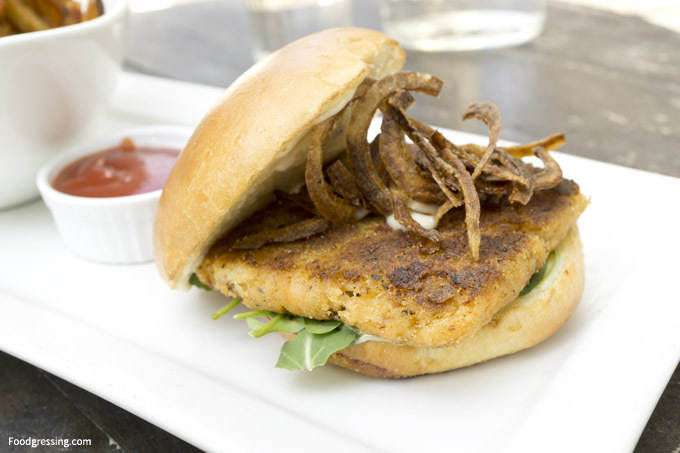 The crab patty was pretty much the same as I remember it – crispy and moist. The bun, however, was a little dry. The fries were too salty and seemed a little overcooked. 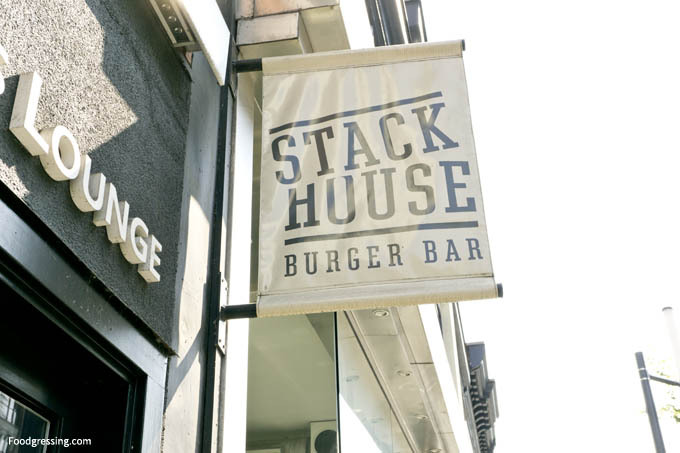 The quality of the food at Stackhouse Burger Bar seemed better in my previous visit a few years ago. However, the prices were about double what they are now. The new $7 dine in menu, which includes a burger with fries or salad, offers a more affordable meal. 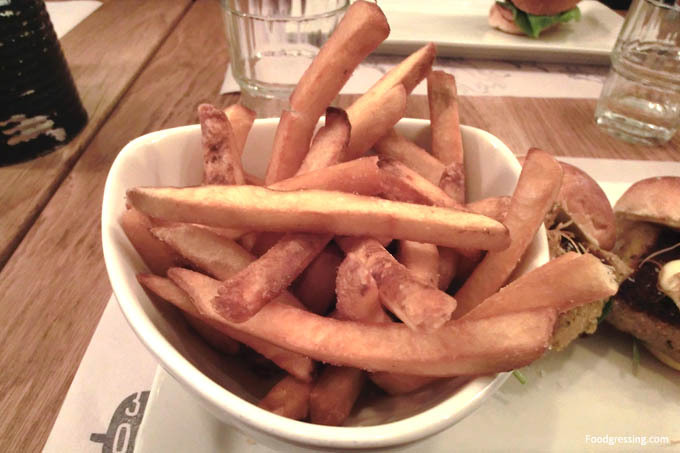 There were some misses in my meal like the brioche bun being on the drier side and the fries being too salty. I would describe my recent experience as “just okay”. 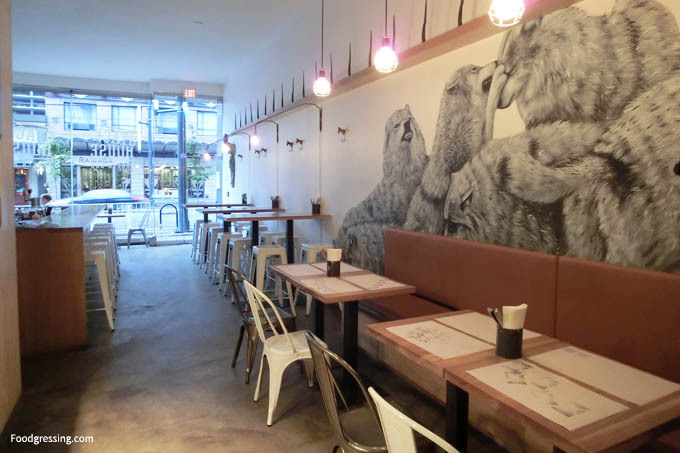 Looking for cheap street food while on the go in Downtown Vancouver? 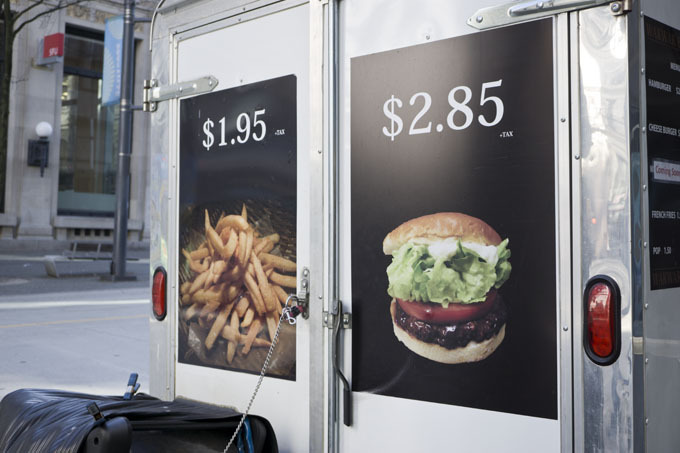 Consider popping by the Hamburger $2.85 food truck for some quick eats. 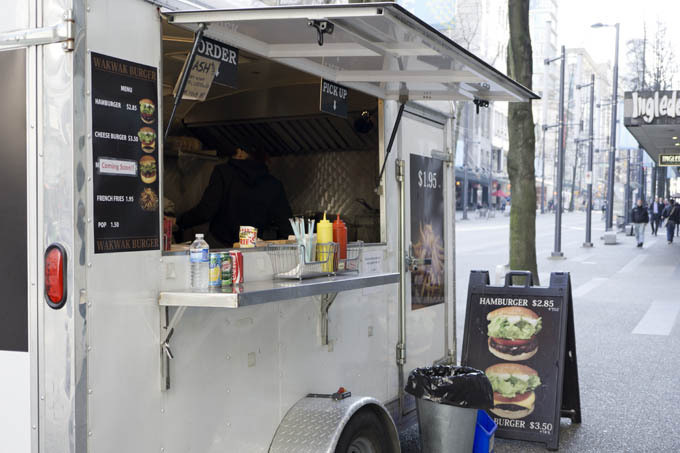 The concept is simple and the food truck’s name says it all – hamburgers for $2.85. 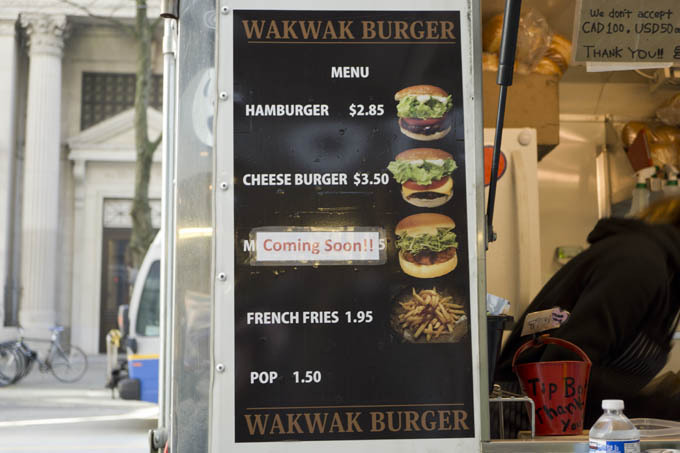 This food truck also has cheeseburgers for $3.50, french fries for $1.95, and pop for $1.50. I asked the staff person what “WakWak” meant and she defined as “excited” in Japanese. The food truck has a few signs around it to showcase the budget-friendly offerings. The hamburger was simple and delicious. 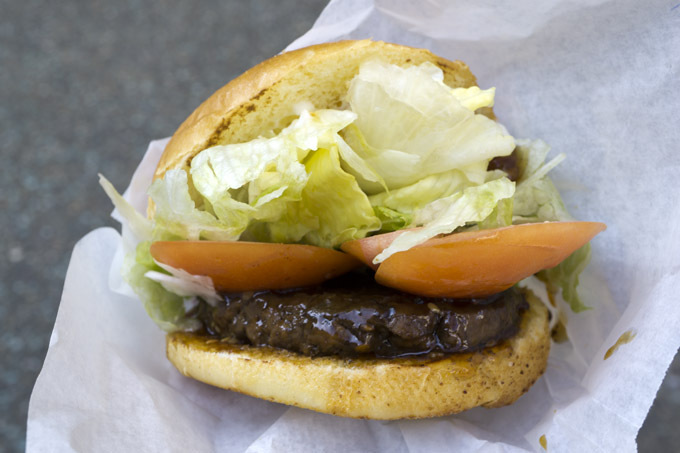 Soft toasted buns, hamburger patty with teriyaki sauce and mayo, and fresh lettuce and tomatoes. The portions of lettuce and tomatoes were impressive. I liked having a nice crunch from the lettuce. Fries were $1.95 and nice and crispy. 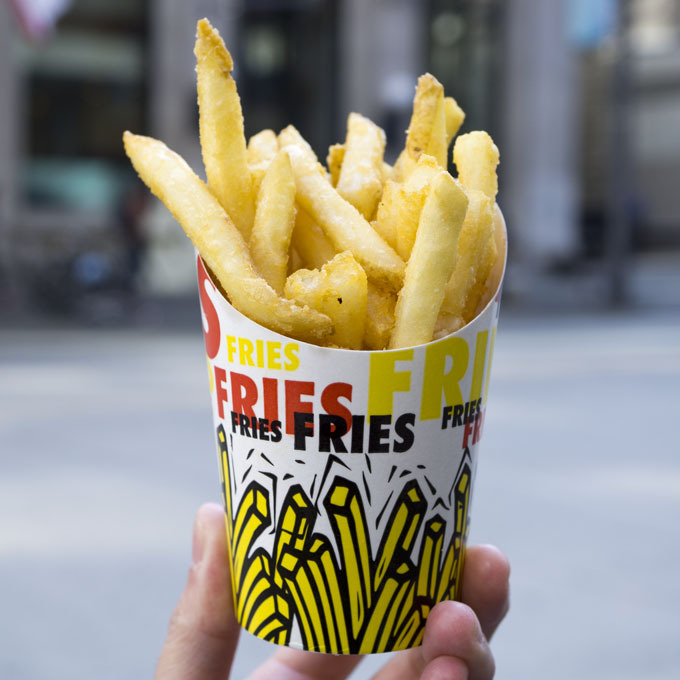 I like the cute packaging of the fries! 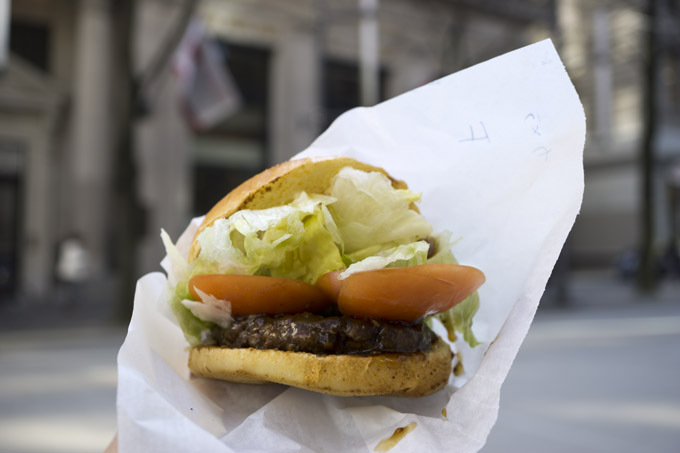 Hamburger $2.85 is a delicious yet cheap option for a food truck. 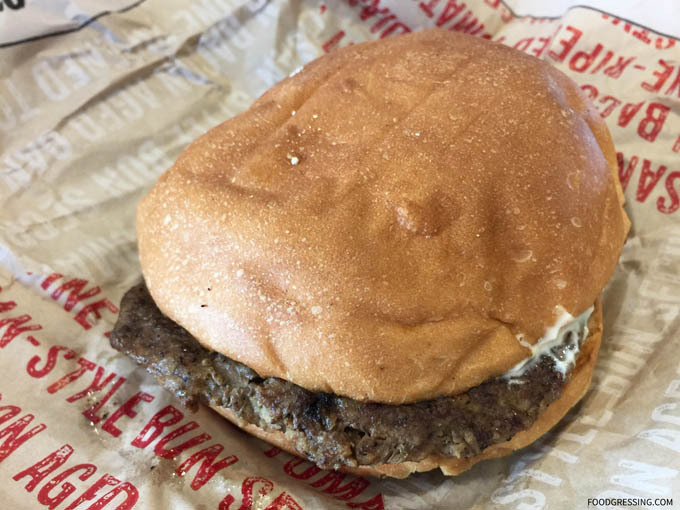 They do a great job making this simple burger. It is refreshing to eat something that is *not* marked up excessively. 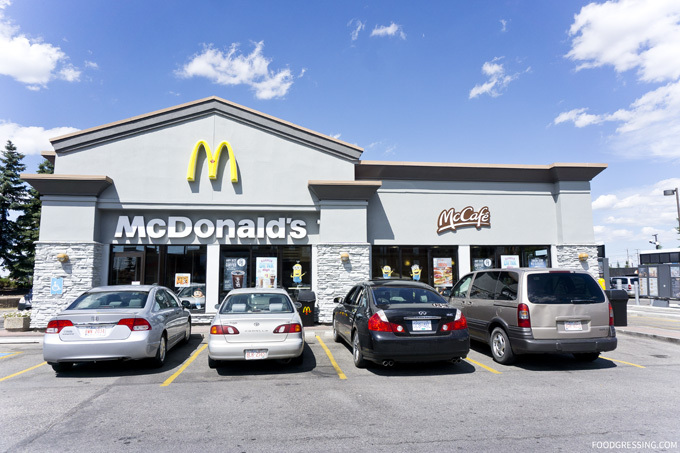 Why go to a franchise fast food restaurant for something similar? 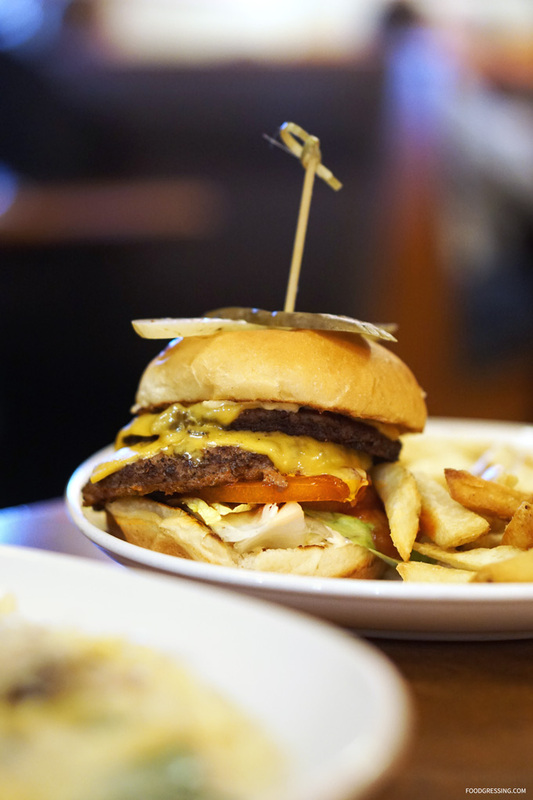 If you are still hungry after one burger, just go ahead and order another!